Her parents were both college professors. Her unusual first name is derived from the Italian for an opera stage instruction, con dolcezza, meaning "with sweetness". Rice was raised in segregated Birmingham during the civil rights movement. A childhood friend, 11-year-old Denise McNair, was one of the four young girls killed in the bombing of Birmingham's 16th Street Baptist Church in 1963. Rice never became involved in the civil rights movement, but she says, "My parents had me absolutely convinced that, well, you may not be able to have a hamburger at Woolworth's but you can be President of the United States." She mastered the piano at three, and was told that she could have had a career as a concert pianist. She skipped first and seventh grades, entered college at 15, holds three degrees including a doctorate in political science, and earned her Master's in just one year's study. She was a professor of Political Science at Stanford from 1981-99, and from 1993-99 she was also Stanford's provost, responsible for overseeing the school's budget and academic programs. She served as a mid- to upper-level member of the National Security staff during the first Bush presidency, and as National Security Advisor during the second Bush presidency, before succeeding Colin Powell as Secretary of State in 2005. She was the second woman to be US Secretary of State, after Madeleine Albright during the Clinton administration. She was the first black woman to be Secretary of State, and she held the highest position in a presidential cabinet that any black woman has held. Little is known of Rice's personal life, except that she has never been married. She is reportedly a good ice skater and a knowledgeable football fan, and she dated the Denver Broncos' Rick Upchurch while she was attending the University of Denver. She once owned a house and shared a line of credit with another woman, Stanford co-worker and documentary filmmaker Randy Bean, although the nature of their partnership remains unknown. More recently, she occasionally had football executive Gene Washington on her arm when she attended State Department events, but their relationship was described only as "cordial". 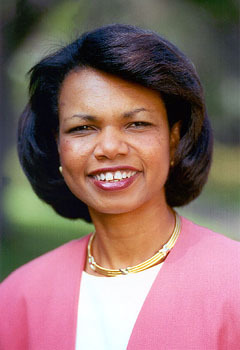 At a dinner party while Rice was National Security Advisor, she referred to President George W. Bush as "my husband" before abruptly correcting herself. She was on the Board of Directors at the Chevron Corporation, where an oil tanker was named in her honor. When this became a point of embarrassment for Rice, spotlighting her links to the oil industry, the Condoleezza Rice was rechristened the Altair Voyager. "Gay Rumours Eclipse Condi's Glory Moment", The Sunday Times (London), 2 December 2007. Quoting Anne Roifes, "It is widely believed in gay circles that Condi is a lesbian... that could be one reason she will not run [for Presidential nomination]." Also, "First Clinton, Now Condi... Murdoch Papers Go Lesbian Mad", The First Post, 3 December 2007, mentioning reports that Rice as Provost at Stanford "was completely out as a lesbian and it was not a scandal, just a reality" and her purchase, with Randy Bean (an unmarried woman), of a house together. Ms. Bean stated that the property was an investment, not a cohabitation. Switched from Democratic to Republican in 1982.